Japanese Vehicles Only. Coupon must be present at time of service. Not valid with other offers or prior service. Our A/C Performance Check Includes: Check AC Pressures, Check and Clean Condenser, Test Cooling Fan. We are a family-owned business delivering honest and professional automotive repair and auto maintenance services to the people of Alpharetta and surrounding areas. 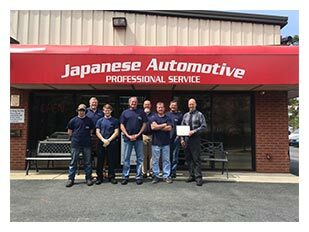 The quality ASE (Automotive Service Excellence) certified technicians at Japanese Automotive Professional Service employ today’s latest automotive technology and are equipped to handle all major and minor repairs on foreign and domestic vehicles. "My family and I were visiting from out of state and needed some work done on our 2007 Toyota Camry. Our hosts recommended Japanese Automotive as they have had great service there. Jody, the owner, had us bring our car over immediately and promised it would be done the same day. The repairs were made in a timely fashion and we were more than pleased when we received our bill. Anyone looking for an honest, reasonably priced mechanic will not be disappointed using Japanese Automotive." "I brought my Honda S2000 here for the 2nd time last week and have been very impressed with Brooks who works there. Finding a friendly and honest shop takes away so much stress from the process of getting work done to your car. Everyone there seems friendly and they have one new loyal customer here." "Love this place! I bought the groupon and made an appointment during my lunch break for an oil change. I was in and out in 30 minutes!! The were fast and friendly. They didn't try to talk me into a bunch of other things for my car. I will definitely be back!" We currently offer the NAPA AutoCare Peace of Mind Warranty, which provides our customers with 24 months/ 24,000 miles of worry-free protection on qualifying parts and labor. Wherever you may travel, our warranty is honored at more than 14,000 NAPA AutoCare locations across the country. Our auto repair shop is conveniently located in Alpharetta, GA. Our quality mechanics are equipped to handle all major and minor auto repair services. Japanese Automotive Professional Service is a certified NAPA AutoCare Center; we are able to provide the benefits of an established national entity while maintaining the personal touch of a family-owned business. We understand that your vehicle is a major investment, and that is why we care for each customer’s vehicle as if it were our own.